This is one of the binoculars of note from the 2007 Midpriced Binoculars Round Up. 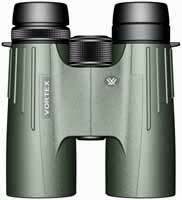 If you can spend $1000 or more for a binocular, you can get a somewhat better binocular than the Vortex Viper, which costs half of that. But if you're weighing cost against quality, we think the Viper is one of the best bargains in the marketplace. It has a smooth focus knob and a locking diopter adjustment. The 8x42 model has long eye relief, which is a relief for the a person who wears glasses. The optics are very good. And the warranty is unbeatable. The Viper is available in 8x42 and 10x42.